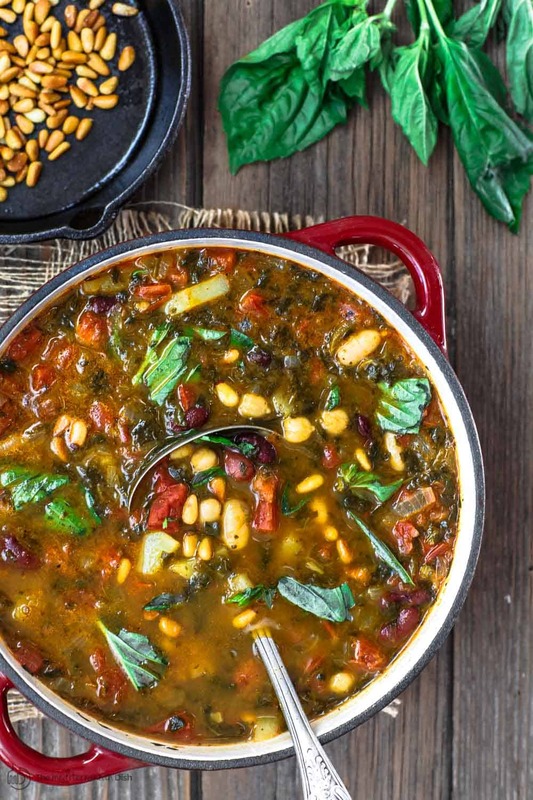 This Mediterranean three bean soup recipe with tomato pesto is one power-packed vegetarian and gluten free dinner to feed a hungry crowd! And if you ever thought beans are boring, this delicious, cozy soup will blow your mind. I guarantee it! Three humble cans of beans and a few vegetables take on aromatics and warm Mediterranean spices. To brighten things up, we stir in a fresh tomato pesto at the end (a must!) Be sure to read the tips and watch the video for how to make this bean soup below. But my latest soup obsession is this Mediterranean three bean soup recipe. Layers of flavor! If you’ve underestimated pulses or beans, or wrote them off as boring, this bean soup might just become your gateway drug. Once you try it, you’ll want more! Why this 3 Bean Soup Recipe Works? 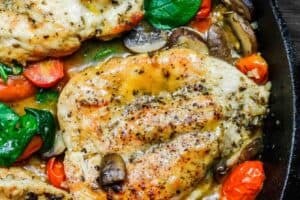 Who doesn’t love one-pot dinner?! And this bean soup will deliver on all fronts: easy, healthy, flavorful, and budget-friendly. 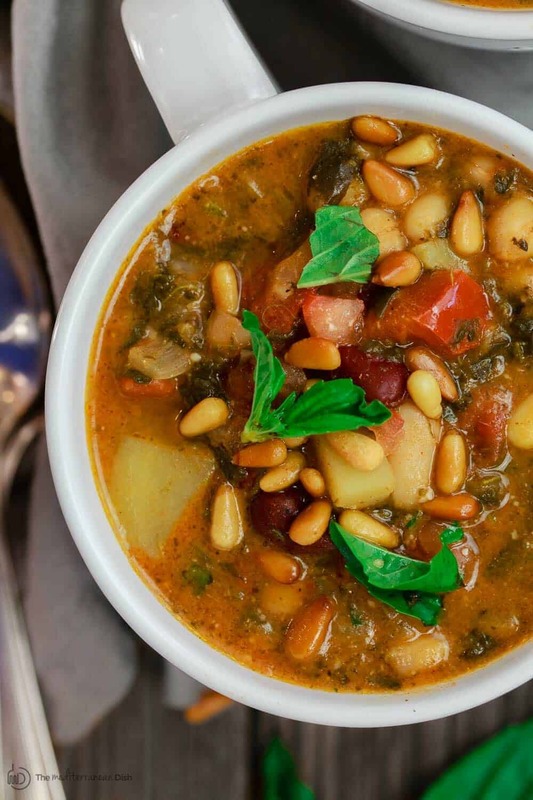 In this Mediterranean bean soup recipe, we have a fabulous fusion of pulses that are available in most pantries—kidney beans, cannellini beans, and chickpeas (or garbanzo beans). I take a major short-cut and use canned pulses, but you can certainly use dry pulses. You just have to soak them overnight then cook them before using in the soup. To make it even more hearty and satisfying, I add in potatoes, spinach, and some diced tomatoes. 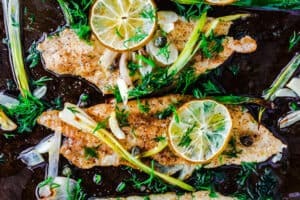 Flavor here begins with aromatics in the form of onions (which are the start of everything wonderful) and warm spices like organic coriander and paprika. But what truly takes this bean soup recipe over the top, and literally SMACKS YOU IN THE FACE with FLAVOR, is the fresh tomato pesto we stir in at the very end. A MUST! With three kinds of pulses (beans) in here, this soup packs a ton of plant-based protein (more than 23 grams per serving); fiber; B vitamins; and complex carbohydrates. And with the addition of tomatoes and spinach, a good dose of vitamin C and iron! And yes, good-for-you fat (no apologies here). 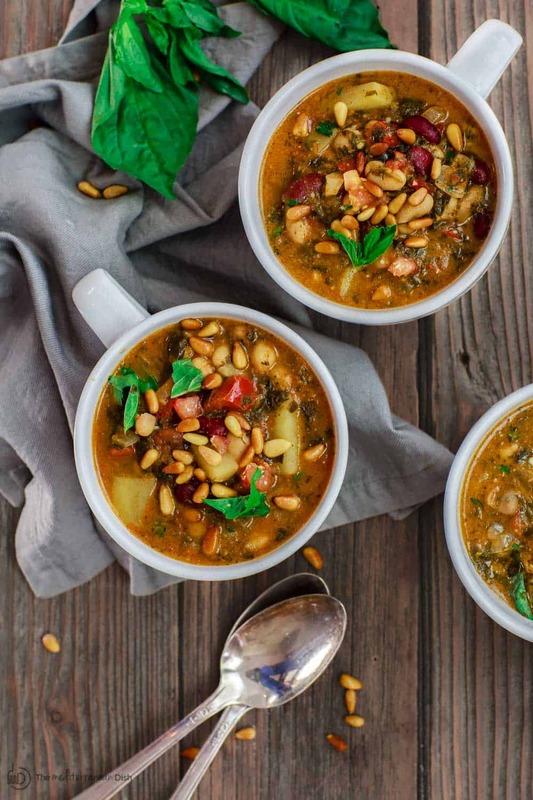 And if you’ve been following the USDA’s recommendation by adding to your diet a ½ cup of pulses 3 times per week (USA Pulses and Pulse Canada call this the Half-Cup Habit), you’ll definitely want to add this bean soup to your dinner rotation! This bean soup feeds a crowd, but for our little family of four, it can make for two dinners. To make ahead, I like to make this bean soup a day or so in advance, but I hold off on making the tomato pesto until the day of. To freeze leftover bean soup, simply store in freezer-safe glass containers or heavy-duty freezer bags and freeze (we usually use up this frozen bean soup in a month or so at my house.) Thaw out in the fridge overnight, heat over medium heat, stirring regularly. 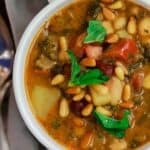 Can I use Dry Beans Instead of Canned Beans in this Bean Soup Recipe? Yes, but you’ll have a couple of extra steps. And you will need to start at the least the night before you need to make the bean soup recipe. To make this bean soup with dry beans, you will start with 3/4 cups dry beans in place of each 15-ounce can of beans. You must soak each kind of beans in a large bowl with plenty of water (water to cover the beans by 3 inches.) They will nearly triple in size while soaking. Discard soaking water before cooking. Cook each kind of beans separately. In a cooking pot, add beans and cover with water by 2 inches. Bring to a boil, skim off and discard any foam on the surface. Reduce heat, cover and simmer gently, stirring occasionally, until beans are tender, 1 to 1 1/2 hours. 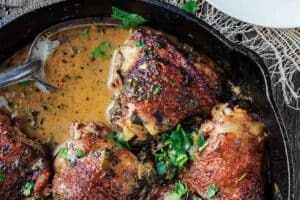 In a large Dutch oven or heavy pot, heat two tbsp of olive oil. Reduce heat to medium and add the diced potatoes and onions. Cook for about 4-5 minutes, tossing regularly. Add tomatoes, vinegar, spices, salt and pepper. Stir to combine. Cover and cook for another 4 minutes. Uncover, add vegetable broth and frozen spinach. Raise heat to medium-high and bring to a boil for 4 minutes or so. Add the kidney beans, cannellini beans, and chickpeas. Bring back to a boil, then reduce heat to medium-low. Cover and cook for another 15 to 20 minutes (potatoes should be tender at this point). While soup is cooking, make the tomato pesto. In the bowl of a food processor fitted with a blade, place garlic and tomatoes. Pulse a few times to combine. Add basil and puree. While processor is running, drizzle in the olive oil a little bit at a time. Transfer the thick tomato pesto to a bowl, and stir in grated Parmesan. When soup is ready, remove from heat. Stir in the tomato pesto. Transfer to serving bowl. 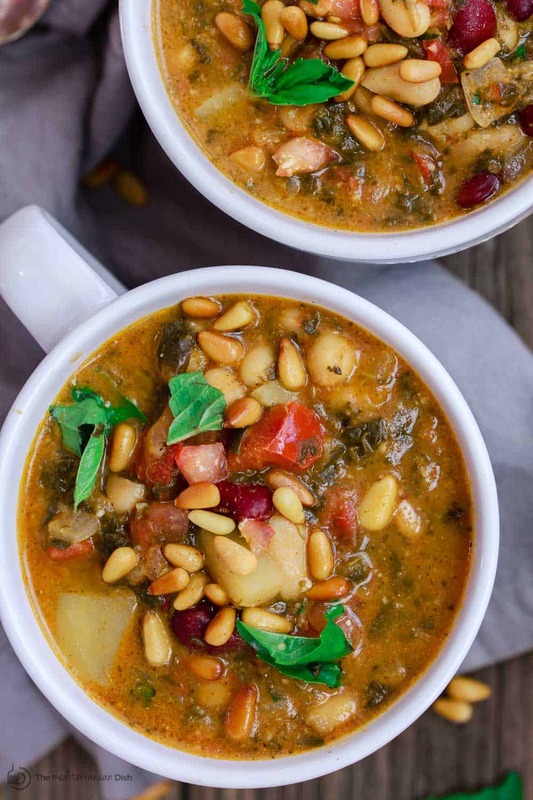 Top each bowl with a few basil leaves and toasted pine nuts. Enjoy with your favorite crusty bread! Cook’s Tip: This soup is great to serve a crowd or for meal prep. To store leftovers, use glass containers with a tight lid and refrigerate for 2 to 3 days. You can also freeze cooked bean soup in portions. Thaw overnight in the fridge and heat stovetop over medium heat, stirring often. Cook’s Tip for Using Dry Beans: You can make this bean salad using dry beans. Budget enough time to start at the least the night before you need to make the bean soup recipe.To make this bean soup with dry beans, you will start with 3/4 cups dry beans in place of each 15-ounce can of beans. You must soak each kind of beans in a large bowl with plenty of water (water to cover the beans by 3 inches.) They will nearly triple in size while soaking. Discard soaking water before cooking. 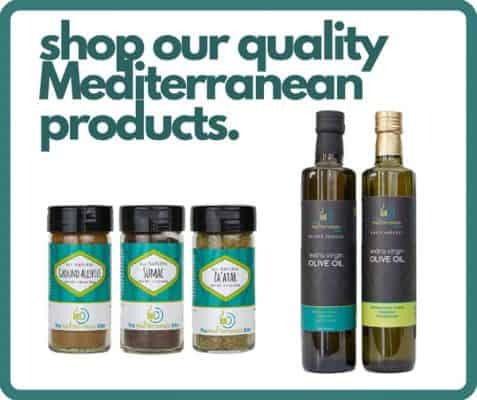 Recommended for this recipe Our Private Reserve Greek extra virgin olive oil (from organically grown and processed Koroneiki olives). And from our all-natural and organic spice collections ground coriander and Spanish paprika. SAVE! 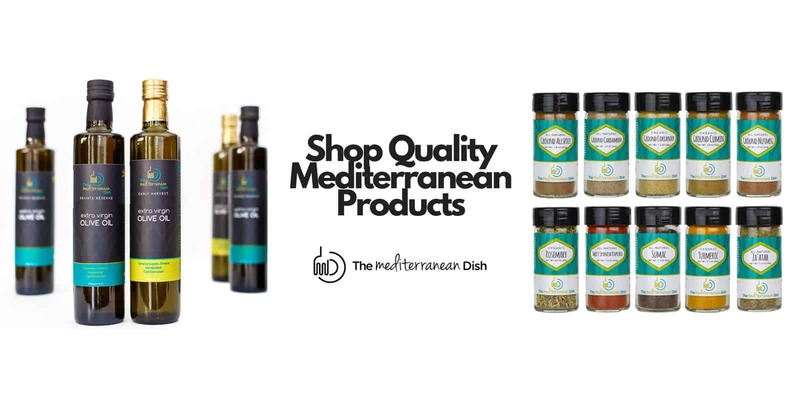 Try our Ultimate Mediterranean Spice Bundle, or create your own 6-pack or 3-pack of spices from our all-natural and/or organic spice collections! You mentioned in your video that you do the tomato pesto the day that you’re going to be serving this soup. 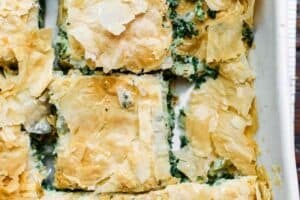 However, are the leftovers OK with that pesto in it to go ahead and either save in the refrigerator for a day or two or to put into the freezer? Hi Barbara, yes, I do this because if there are leftovers, then they’ll be good for a couple of days or so in the fridge. And yes, you can freeze it for later use. Delicious, hearty, different. My family and I have really enjoyed this soup! Great! So glad you guys enjoyed it! I have made this soup several times, and I love it. 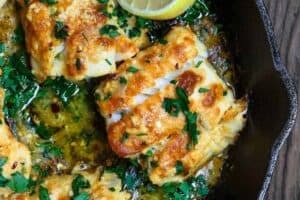 The fresh taste of the tomato pesto just makes this dish! I make a huge batch and put it into individual bowls to freeze for my lunches at work. *I omitted the potatoes because they don’t freeze well. Thanks so much for sharing, Kristine! I love this soup! I make it a lot now. It’s so flavoursome and warming. I make a lot of soup but I think this is my favourite. So pleased I found the recipe. Awesome, Bev! This is one of my favorites too! Cooked as described, brilliant!! My only problem with it, is that I have a weeks’ worth of leftovers..I live alone, and there is a lot to consume too. PLEASE DON’T take that as a criticism, heading for a second serving now! Thank you!! What a super fun video to watch. You are right. Most of the ingredients are in the cupboard, but never thought of doing a tomato basil pesto, but will definitely give this a go. Will probably add some toasted garlic bread to dunk with. Wonderful, John! I am so glad you enjoyed it.